Researchers estimate the storm’s rainfall forecast is 50 percent higher because of warmer oceans and more moisture in the atmosphere brought by global warming. Hurricane Florence lumbered toward the Carolinas on Thursday as a slow-moving giant, churning up a powerful storm surge that could reach 13 feet at high tide and devastate hundreds of miles of shoreline. Adding to forecasters’ fears was the storm’s potential to bring days of torrential rain to the already saturated region. The hurricane was unusual for a variety of reasons—and it was being made worse by climate change, a team of scientists said Wednesday. The scientists—from Stony Brook University, Lawrence Berkeley National Laboratory and the National Center for Atmospheric Research—compared the storm’s real-time forecasts to what would be expected if the ocean temperature wasn’t so warm and the atmosphere lacked today’s additional heat and moisture fueled by climate change. 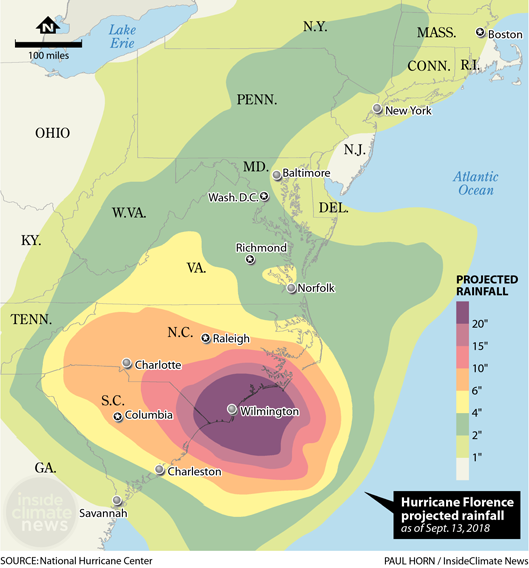 They estimated that Florence’s rainfall forecast is more than 50 percent higher than it would have been without global warming, and that the hurricane’s projected size is about 80 kilometers larger. It was a quick study, and more extensive analysis after the storm will fine-tune those estimates, other scientists said, but they acknowledged that it’s indicative of human influence on extreme weather. The storm’s direction, extreme rainfall and slow movement all set it apart while raising concerns about what Florence could suggest about the future. Florence’s path toward the North Carolina coast is one if its many unusual behaviors. Most previous hurricanes on a track like Florence’s headed north and then east, paralleling or brushing the Southeast coast. They typically move on a clockwise path around a stable bubble of air that can cover the entire mid-Atlantic. But this year, that high-pressure dome has shifted, squashing Florence toward the coast. A similar pattern steered 2012’s Superstorm Sandy on an unexpected path toward New Jersey. Scientists say it’s too soon to tell if Florence is a warning that more hurricanes will hit the densely populated Northeast coast, but they are growing more certain that global warming will make some of the coming tropical storms intensify more quickly, move more slowly and drop more rain. “With Florence, there’s a lot I would say that’s consistent with our understanding of how global warming affects tropical systems,” said Woods Hole Research Center president and director Phil Duffy. Not all the science is set, but the global warming projections are robust for more Category 4 and 5 storms, as well as a trend to more rapid intensification, he said. The atmospheric pattern that’s steering Florence toward the coast also appears to be happening more often with climate change. This is part of the emerging understanding of how rapid warming and ice melt in the Arctic is changing climate patterns in areas where people feel the effects, he said. As Florence approached the Carolinas, four other tropical storms were also spinning around the Atlantic. In the Pacific, Olivia hit the Hawaiian Islands from an unexpected angle, and Super Typhoon Mangkhut threatened to become the strongest storm ever for Hong Kong. One of the most interesting, if still tentative, connections between hurricanes and global warming may be the tendency of tropical weather systems to stall and spin in place, generating more flooding rainfall in concentrated areas, said Penn State climate scientist Michael Mann. It happened last year when Harvey sat over Houston for days, deluging parts of the region with more than 50 inches of rain. There is evidence that hurricanes may be slowing down. 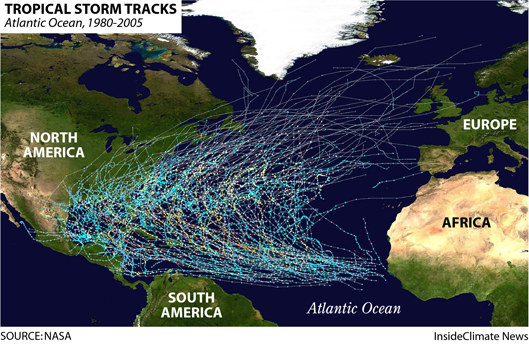 A recent study in the journal Nature led by NOAA hurricane expert Jim Kossin looked at the data on hurricanes from 1949 to 2016 and found they slowed by 20 percent in the Atlantic Ocean and by as much as 30 percent in the Pacific. When storms have a slow approach before making landfall, that also lengthens the amount of time that coastal areas are subjected to storm surge, when winds can drive the ocean more than 10 feet above normal sea level. That impact is compounded by the fact that global warming has already raised sea level along the North Carolina coast by about a foot since the late 1800s, climate scientist Stefan Rahmstorf of the Potsdam Institute for Climate Impact Research wrote on Twitter. 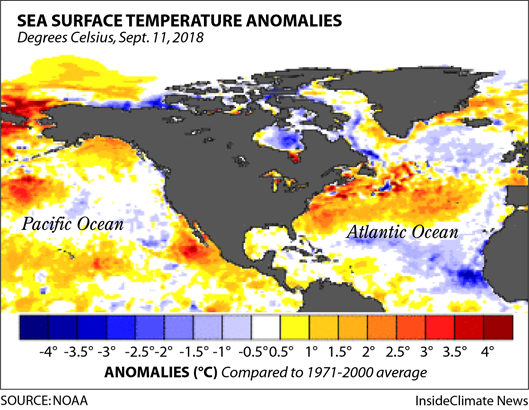 Hurricanes are primarily fueled by ocean heat, so it’s not surprising that recent years, with sea surface temperatures at or near record highs, have seen a spate of record-strong storms. Oceans have absorbed about 93 percent of all the heat trapped by greenhouse gases, heating the ocean on the surface and increasingly to greater depths. Projections for more rainfall from tropical storms are also robust because of basic physics — air can hold more moisture the warmer it gets, and when that air is stirred up by a hurricane, the moisture manifests as intense rainfall. The National Oceanic and Atmospheric Administration writes that if the planet warms 2 degrees Celsius above pre-industrial times – exceeding the goals of the Paris climate agreement — rainfall from tropical storms is expected to increase 10 to 15 percent. Figuring out whether global warming will steer more hurricanes toward the densely populated Northeast is important for obvious reasons, but scientists aren’t quite there yet. Accurate observations useful for climate projections only go back to about 1850. Before that, data is sparse, said paleoclimate researcher Amy Frappier, who chemically analyzes stalagmites in Central American caves to track rainfall from ancient hurricanes.